Avast Ye! Today, it be Talk Like a Pirate Day an’ we’ve got a barrel-load of piratey-themed sights fer ye landlubbers! Las Vegas’ Treasure Island be havin’ a daily pirate battle, ‘ere the swashbucklers by defeated by th’ booty-shaking o’ “the sirens o’ ti”. Not yer usual kind o’ booty neither! 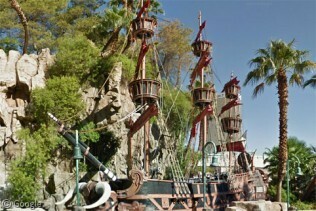 Them “Pirates of the Caribbean” movie-films wi’ buccaneer Johnny Depp, they be based on a children’s ride! Those children orta be workin’ the sail and swabbin’ the decks! Arrr! There be a swashbuckling ship maze on the Isle of Wight! Shiver Me Timbers! This even be a plane in middle o’ Santa Cruz, ‘ere they be callin’ it ‘Th’ Pirate Plane’! Flyin’ Pirates? Whaterenext! Be seein’ you also The Pirate Skull of Vegas. Thanks to these scurvy dogs: Juan Manuel Gil, bruv, Virtual Globetrotting and Munden. Treasure Island is going for a new twist on the Pirate Theme and they are called “TI” and instead of a Pirate show – it is a “Siren” show … But today they should be Siren Pirates. Arrr! Ye no read th’ post did ya Courtney? I bleedin’ said that thar in th’ post! Shiver Me Timbers! Arr! From now on any scurvy sea dogs that don’ read th’ posts should walk th’ plank I say! I think that maybe I don’t speak Pirate … maybe this year I can pick it up in time for the next September 19th. Here’s a link to a pirate-themed mini-golf course in a Detroit suburb. The large object to the upper left (next to the batting cages) is a full-size pirate ship with several golf holes on the deck.